Big thank you once again to the wonderful folks at Encore Cinemas who allowed us to film our most complicated scene yet. 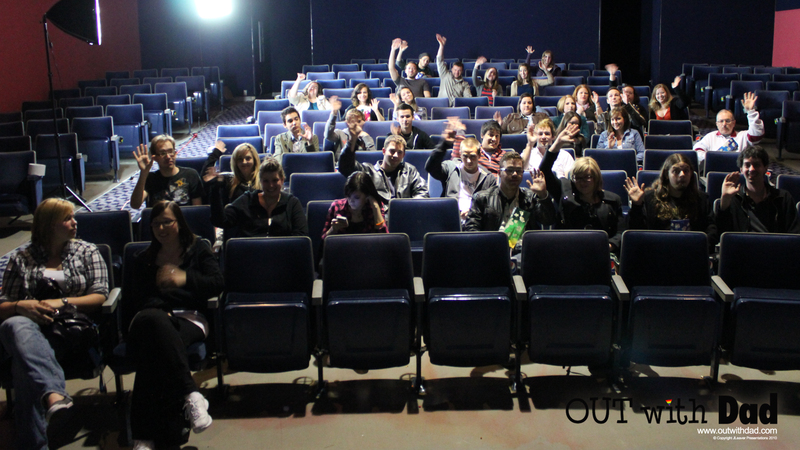 And of course – where would we be without the dozens of people who came to volunteer as other audience members for our scene? We couldn’t have done it without you. Loads of people commented and voted on our poll about the episode durations. Overwhelmingly, people like the idea of longer episodes. I do too, I’m glad you agree. We’ll try to keep it up when we can. Next episode probably won’t be quite as long, it’s only one scene – a long scene with lots of great music. Jason – finally got a chance to start watching. This episode was great. Nearly spit out my coffee in the theatre scene and then I was fighting back the tears. Well done – I laughed, I cried…. when is season two coming out? i was at the edge of my seat!! amazing acting! That was great! The opening sequence as a little painful, but it was good setup for the subway scene (with the eye flirting). Dad’s incompetence at handling the subject was quite amusing, but he rallied beautifully. I find myself actually wanting to learn more about Rose’s mom now. Very nice work.